A return by an old friend. Previously appearing on this list at #54, Dahl’s later classic sinks to a not terrible #88. Does that mean that other Dahls that have not been on this list before will make an appearance? Only time will tell . . . I was unaware that Roald Dahl liked to put references from one of his books into another. 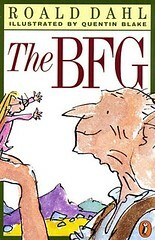 But according to Anita Silvey’s 100 Best Books for Children, “In the second chapter of Danny, the Champion of the World, Danny’s father tells his son a series of bedtime stories ‘about an enormous fellow called The Big Friendly Giant, or the BFG for short.’ Huh! Who knew? For this book, editor Stephen Roxburgh apparently (according to Silvey) “spent days drafting his editorial suggestions to Dahl, ten typed, single-spaced pages that commented on inconsistencies, cliches, and matters of taste.” Whew! Prior to the publication of this book Roald Dahl tried his hand at the story George’s Marvelous Medicine. Adults were rarely entirely pleased with Dahl’s stories as they came out, but they definitely disliked this one in particular. 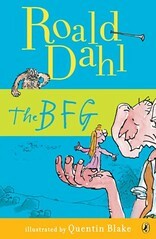 So BFG was a welcome relief and a much more popular book when it as released. This last one kind of amused me too. In British Fantasy and Science-Fiction Writers, 1918-1960, the section on Roald Dahl gives this immensely silly book the fully academic once over. Say they, “Dahl uses several devices effectively in this book. Foremost among these is his extensive use of made-up language. He uses invented words in all his books, but not nearly to the extent that they are used in this story, and they are the kind of words that will make his young readers giggle, often because of their naughty or nasty implications . . . But the term that undoubtedly breaks up new readers the most, year after year, is whizzpopper; that is to say, flatus. Whether one approves of such material in children’s books or not, it must be admitted that Dahl handles it with relative decorum.” The use of “flatus” in that paragraph just cracks me up. Particularly when it is follow by a sentence that uses the term “relative decorum” with a straight face. 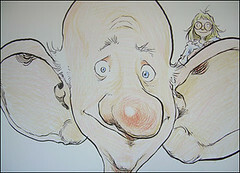 Chris Riddell tried his own hand at a version of the BFG. 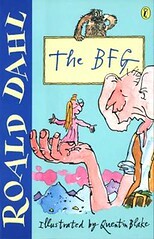 As for the official covers, it’s pretty much Quentin Blake from here on out. Another childhood favorite! My 2nd grade teacher read this to us and I fell in love with Roald Dahl. This one is my absolute favorite, though. My favorite thing about Dahl, and this book in particular, is that he feels that sticky area for young readers between early chapter books and full blown novels. He has such universal appeal, he can get struggling readers to read up while still appealing to the proficient. A perfect third grade book.